FEAST: A Dinner Journal A unique quarterly food magazine which celebrates seasonal eating. All the features within the magazine lead to one final meal and a celebration of passionate food producers and craft. 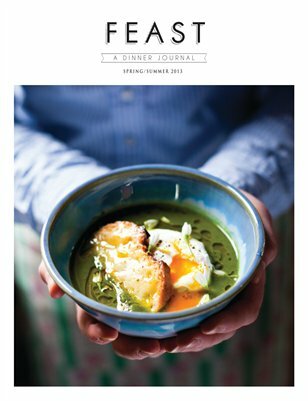 In this issue you can find recipes from some of Ireland's most exciting faces in food like Ballyvolane gravadlax, wild garlic soup with a poached egg and Irish cheese toasts, braised Connemara hill lamb shanks with gremolata and wild garlic mash, hedgerow cocktail with elderberry gin, rosemary and olive oil sourdough bread and Brown Hound Bakery lemon temples.